I actually nodded in agreement! I recommend taking the time to read The Curious Gardener over these next winter months. Has anyone else read it and what did you think of it? A book review of Anna Pavord's "The Curious Gardener" by Paul Jung, owner of a Toronto organic and ecological gardening services company. The Curious Gardener is part organic gardening 101, travelogue (visits to Corsica and Costa Rica), and personal diary written in an easy-going and not overly-"instructional" manner. Her observations and gentle rants are painfully funny and sobering at times, skewering designer mulch, “wizard” tools, and a certain New York city florist. I bought it, read about three quarters, but found it to be a challenge, and have since set it aside! I adored 'BULB' and she also wrote one called 'The Naming of Names' - a history of plant names - both remain firm favourites, but this one just didn't work for me. I have been reading 'Against A Wall' by plantswoamn Ursula Buchan, of Athyrium 'Ursula's Red' is named after, and it has been a much easier read. Gardening books are like gardening styles. What works for some, clearly doesn't for others. you're absolutely right, books (as all works of art) are subjective creatures and we either "get them" or don't. I breezed through The Curious Gardener but others found her other book The Tulip ummm, "more challenging." I'll see if "Against the Wall" can be borrowed from the library. Thanks for dropping by! 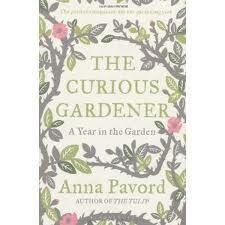 'The Curious Gardener' sounds like the antidote (and a much needed one) to Ann Warehams 'The Bad Tempered Gardener'. well, gardeners run the gamut of all emotions and psychological states, I've been "curious" and then "bad-tempered" after visiting some garden centres and their version of customer service, lol! Thanks for posting.